You just installed a theme, but you notice that there are a few things not quite to your liking. You can’t change it in the options, so you’re left with getting your hands dirty with CSS. What is the best way to go about doing that? There are plenty of plugins that help you add a new stylesheet, but there is one that most people probably have installed already: Jetpack. The Custom CSS module is just one of the many features that comes with the plugin (you can see the entire list here). You can enable the feature under Jetpack > Settings. After enabling it, you will find a CSS editor under Appearance > Edit CSS. 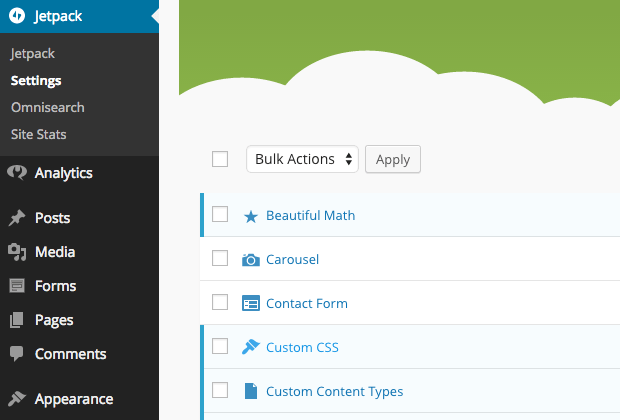 The Jetpack CSS editor comes with a few nice bells and whistles. It supports LESS and Sass, and you have the option of removing the theme stylesheet and replacing it with the custom stylesheet you wrote. Furthermore, the Jetpack CSS editor saves revisions of your stylesheet. If you don’t like having to sign in to WordPress.com to use this feature, you can try Slim Jetpack or just use another plugin like Simple Custom CSS. Child themes are a way to extend your current theme with new functionality, all without touching the code of the original parent theme. There are quite a few guides online that walk you through the creation process. Once you’ve create and activated your basic child theme, it will inherit all the styles and functionality of your parent theme. A child theme only needs a style.css file to work, and that is where you can add your own styles. Creating child themes just to override some CSS might not be the easiest way to change the look of your theme. Thanks to a nifty plugin called Child Theme Configurator, it’s probably not so hard after all. I haven’t tried the plugin myself, but it looks like it packs a bunch of useful features, including easy creation of a child theme, child theme CSS editing, and identification of parent theme selectors. If you need to edit the theme stylesheet directly for some reason, it is possible to do so within the WordPress admin area. Users with administrative access will be able to edit theme files under Appearance > Editor. The built-in editor is rather bare-bones and not as nice as the one packaged with Jetpack. Be aware that unlike the Jetpack editor, the built-in editor does not save revisions. Also be aware that any user with administrative access will be able to edit your theme files. It is probably best to disable the built-in editor unless you absolutely need it.